and we have a message we want to share." Described by Kerrang! Radio’s Alex Baker as a band possessing “killer riffs, monstrous vocals and more hooks than a slaughterhouse”, London’s powerhouse heavy-rock innovators THE MERCY HOUSE are fighting to bring their music to the masses. 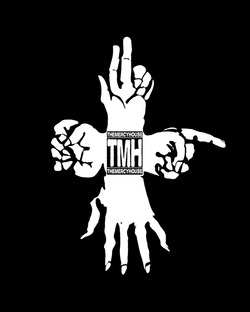 Their debut album "A Broken State of Bliss" was released in 2012 through the band’s own label TMH Records and with distribution from Code 7. Carefully crafted at The Death Dojo with production team The Picasso Brothers, the album was mixed by Donald Clark (Guns N’ Roses, Korn, Muse) and mastered by Mandy Parnell (Depeche Mode, The Prodigy, Björk). It was heralded as a trend and scene defying record, refreshing and vital for today's rock and metal scene. "A Broken State of Bliss" possesses a dark, gritty and visceral post-apocalyptic quality and is strewn with socio-political commentary, the band refused to play up to stereotypes. The arrival of the album was preceded by the release of their anthemic, shotgun-blast-to-the-face single ‘Greed’, a song that Kerrang! Magazine’s Simon Young described as “dripping with menace”. From their inception, the band raised eyebrows by holding their own with such powerful live acts as Paradise Lost, Biohazard and Satyricon. Following the album's arrival their target is now to further cement that fierce live reputation across the country, unlike most The Mercy House have been able to play across genres thanks to the myriad of influences and rock stylings found in their music. In the last year they have toured with the likes of legendary rockers Viking Skull and Audrey Horne, appeared at festivals including Bloodstock Open Air (alongside Alice Cooper), Hammerfest and Hard Rock Hell and played a number of well raucous sold out London club shows. The band is poised to strike at the heart of the rock scene with an iron fist. The Mercy House are coming for you.